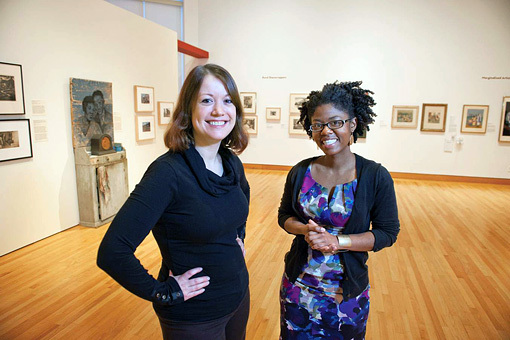 Elizabeth Gallerani '03, left, with Dalila Scruggs '02 at the Williams College Museum of Art exhibit "African Americans and the American Scene," which Scruggs curated as her concluding project of her Mellon fellowship. Gallerani coordinates Mellon programs at Williams and worked wtih Scruggs. Photo courtesy of Petegorsky/Gipe. A view of the exhibition "African Americans and the American Scene" at the Williams College Museum of Art. 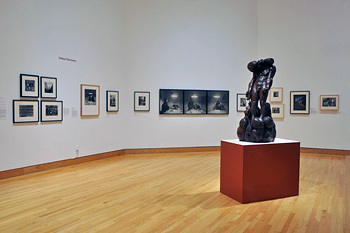 The sculpture "Lynching" (1936) by Nat Werner is visible at right, in front of Depression-era photographs by Aaron Siskind and contemporary photographs by Carrie Mae Weems. "An art show, like a book, has to tell a story," says Salah Hassan, Goldwin Smith Professor in the Department of History of Art and Visual Studies and professor of Africana studies, noting that when art produced by white artists is defined as "American" and art produced by African-Americans is defined as "ethnic," that story is one of exclusion. Which is why, he says, the "African Americans and the American Scene" exhibition at the Williams College Museum of Art in Williamstown, Mass., is so significant. On view until April 22, the show was curated by Dalila Scruggs '02 as the concluding project of her three-year Mellon Curatorial Fellowship. "This exhibit transcends the exclusionary narrative in art history," Hassan says. "What is brilliant about the show is that it brings African-American artists together with other artists, in a way that redeems African-American artists who were always viewed as if they exist in a different space." 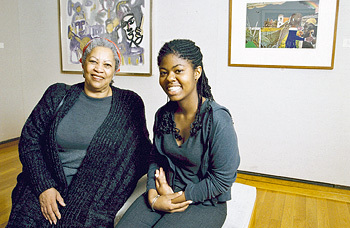 Dalila Scruggs, right, with Toni Morrison, MFA '55, in front of two paintings by Romare Bearden in the Johnson Museum's "Blackness in Color" exhibition on campus in October 2000. Scruggs was then a student intern at the museum and served as Morrison's guide during a tour of the exhibit. Photo: Cornell University file photo. The exhibit juxtaposes contemporary works with Depression-era art, raising questions about where African-Americans fit into the American scene's portrayal of American identity. "One of the things that is really exciting about this time period and also specifically African-American artists, was that in the face of economic crisis they were ready to use their artwork as a tool of protest as well as a way of exploring identity," Scruggs explains. Hassan isn't surprised that Scruggs was able to create such a significant exhibit. As a student intern at the Johnson Museum of Art her junior year, Scruggs helped with a black arts movement exhibition that Hassan organized, "Blackness in Color," as well as the "Visualizing Blackness" conference that celebrated the 30th anniversary of the Africana Studies and Research Center. The conference gave Scruggs the opportunity to meet such luminaries as artist Faith Ringgold and Nobel Laureate Toni Morrison, MFA '55. Scruggs also helped curate an exhibit her senior year as a member of the History of Art Majors Club. 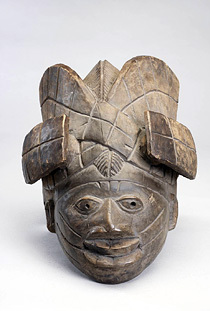 A wood gelede mask from the 19th or 20th century, that was part of the "Who Can Dance? Performing Gender in African Masquerades" exhibit Dalila Scruggs '02 curated at Williams College Museum of Art in 2011. The numerous courses Scruggs took at the Africana Center changed her, she says, giving her a more critical understanding of race, class and gender in the United States. So, as an art history major, Scruggs found creative ways to combine her interests. "I did a lot of my art history papers on the image of the black in whatever class I was taking," she says, such as her paper on how Africans were represented in Italy during the Renaissance. It was perhaps inevitable, then, that after curatorial internships at the Wilsonian Museum of Art in Miami and the Studio Museum in Harlem, Scruggs would pursue a Ph.D. at Harvard University with a focus on African-American art. "It's not surprising to see where Dalila is now," says Hassan. "When I had her in my classes, she really stood out as one of those students who was deeply interested and highly engaged in the subject." During her first year of the Mellon Fellowship, Scruggs worked closely with Elizabeth Gallerani '03, who has been the coordinator of Mellon Academic Programs at Williams since 2007. Gallerani's role is both curatorial and educational; she runs the Rose Study Gallery, an object study classroom, helping professors make curricular connections with the museum's artworks. "I got to know the collection from working with Liz and understanding how she does her job; I learned the collection based on her expertise," says Scruggs. In addition to her "American Scene" exhibit, while at Williams Scruggs organized a showing of the "Posing Beauty in African-American Culture" traveling show, curated an exhibition of African masks, taught an Africana art history course and helped develop a collection plan for new African-American acquisitions. "She's really raised the bar for the next Mellon fellow at Williams," says Gallerani.